Jennifer nearly swerved off the road with the man’s snappy backseat response, as if a wandering wasp had snuck up her sleeve. She had been volunteering as shuttle driver for the 2013 Prefontaine Classic in Eugene when the remark came during conversations with a passenger en route to the airport. Perhaps it was his confident delivery. Maybe it was his credentials—he was an elite coach for a world-class Olympic track athlete. But the comment left a bad taste in her mouth. She felt judged, offended, and vulnerable. At the 40th running of the Western States 100-Mile Endurance Run, Jennifer shared this story with me as we chased shade all day crewing friends. I, too, was intrigued. The comment threw me into a tailspin of thought, its salience particularly jarring as we stumbled through trail ultrarunning’s birthplace, that screaming 100-mile newborn covered in amniotic fluid and delivered in 1974 upon a bed of pine needle and granite. Here, along this thread of Sierra Nevada dirt, you can truly finger through the rich humus of legend. The world has never been the same. Nick Clark and Timothy Olson in the calm before the storm. All photos: Nick Triolo. Okay, back to the comment. Healing. Bringing attention to this word gets me squeamish. I visualize a psychologist’s sofa—soft, red, and worn. Expired books sleep in unreachable shelves while framed certificates hang crooked on the wall. Discerning pupils inspect interior wounds through tortoise-shell-rimmed glasses and bushy eyebrows. The word delivers initial discomfort because it seems to imply that something is wrong with me. Yes, we all carry wounds inside, no matter the quality of our upbringing. Things just happen, to all of us. But if this is true, if everyone walks (runs?) around with some unavoidable blemish, then something cannot simply be “wrong” with us. To the contrary, what if this wounding is precisely the challenge needed to discover our own unique gift, to inhabit our own authentic skin? Stay with me, this is related. Look around. What you see are humans everywhere on the mend. And while some of our healing methods prove effective, some do not. Some help us build firm foundations of confidence and self worth, while others dig us deeper into emotional debt—addictions, cravings, and unhealthy social affiliations to name a few. While spending the entire day on the supporting end of Western States (I was fortunate to qualify and run last year), what I witnessed was not solely an athletic event, but a celebration of healing. And, by the end of the race, I transformed my initial reaction to the statement on “ultrarunning-as-healing” from defensive to deep praise for foot-travel therapy. What I found at Western States included three of the finest ingredients available for proper curative progress and restorative healing. Runners embarking on the 100-mile healing journey. Waking up at 3 am, I ran groggily up to the Escarpment to send updates and welcome runners cresting the high Sierra sunrise. What I experienced was pure magic: 300-plus foot soldiers burning bright in stalwart determination, in praise for a world both awakening and nourishing. As they were later faced with canyon cauldrons and swift rivers tugging at heels, the efforts further deepened my understanding of how integral such elemental contact is, as inherently wild members of a wild planet. Runners crest the Escarpment and pass into the High Country. The art of long-distance foot travel encourages this kinship with the natural world while inviting us to venture into our own inner wilderness of possibility that, by conventional standards, discourages such drifting. When we forge this relationship, we are able to understand what some have termed the “ecological unconscious,” or shared emotional reciprocity with environmental conditions. When the world is under siege, we too are being attacked, and so we experience grief, anxiety, and pain. Conversely, when we enter healthy ecosystems exploding with vitality, we heal. The strength and diversity resonates within ourselves. So, for every training run, for every exploration into mountain hinterland, for every running log scribbled with hours and miles, it is critical to remember that we are simultaneously tracking the healing process of both ourselves and of the world. Finding a shaded corner of grass to nap at Michigan Bluff, I was promptly awoken by the property owner. Certain he was going to kick me off his lawn, instead the man unfolded a lawn chair and set down a sweating bottle of water for me, grinning with gratitude that we were both here, together. Seeking refuge from the heat at all costs. Nick Clark cools his jets with the help of Michigan Bluff’s volunteers. Swirling around the Western States 100 is an unavoidable centrifugal force of community. And it never stops. All year, volunteers, staff, and runners dedicate countless hours of service in preparations. Come race day, families and friends congregate in the thousands to support runners while communities along the course ritually circle wagons around BBQs and storytelling. You see, when we unite around something positive, we heal. We grow. We share and we listen, we support and are supported, we understand and are understood. And then, we are loved. Long-distance running provides a distinctly robust social fabric, a relational weave generating hearty portions of confidence and self worth. I’ve seen it. I’ve experienced it. It’s real. It works. All smiles up the Escarpment. Volunteers await the dog pack. On Sunday, as the last remaining runners stumbled haggardly onto the track to finish before the 30-hour cutoff, I witnessed the potent healing fruits of accomplishment. For me, last year’s build-up to the Big Dance was an incredible journey. The training. The discipline. The commitment. The sacrifice. The fitness. The fatigue. It all fed into one simple goal: to run a strong, mindful race. And it worked. This year, I began to observe every participant as dancing in celebration for the years of discipline getting to that single, dusty footprint. Yassine Diboun executes a stellar performance leading to bliss-face. During the awards ceremony, from Tim Olson’s superhuman effort to the very last runner, every single participant arrived at the start having taken a “Hero’s Journey,” one of set goals, bumps and bruises, and accomplishment. Ultrarunning and its demanding workload naturally creates a strong feedback loop to build confidence and personal growth. The race, then, comes almost secondary to the training rituals and provisions of accomplishment and self-confidence that follow. Cougar chaser Tim Olson and pacer Dominic Grossman finishing off an incredible effort at No Hands Bridge. As ultrarunners, we are indeed healing from something. But everyone is. With running, we join together and we heal. We join together with our goals and are then more likely to accomplish them. The healing deepens. We join together with our goals and accomplishments in natural spaces, and we further the healing process. It is in this shared practice that we find identity and self worth as humans capable of achieving the seemingly unachievable. At the 2013 Western States 100, I witnessed just that—a tightly bound community joined together in celebration, a brave pod of wilderness stewards committed to goals, to pushing their edge, and to healing in the healthiest of ways. I have bottomless gratitude to share this practice of healing with all of you, and to celebrate our ancient offerings of personal transformation every single time I lace up at the trailhead. Timothy Olson en route to healing at Michigan Bluff. One of the best published articles on iRF to date. Awesome words Nick! An amazing and insightful piece of writing Nick…just outstanding. Nailed it. Right in line with other writings about how running (and I might argue especially trail running) makes us better people. Wow, beautifully put. I'm getting verklemmt ovah here. 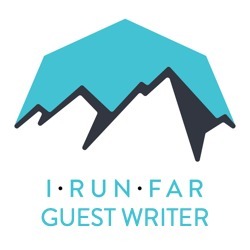 This is the best thing I have read on Irunfar. "…getting to that single, dusty footprint." Thank you! You captured the essence of Ultra Running so eloquently. I drank deeply of each word. Brilliant! Agreed. JFK was around a decade before Western States. Regardless, the article is top notch. culturally speaking, i would argue that it was. Can't be said enough, this was just beautiful. Awesome observation and insight Nick! Write on! Totally healing, absolutely. We are. On trails. During miles. With similar people. Awesome article. Touched. Thanks. There are few articles that truly capture what many of us already know and understand. What a wonderful way to share the truth behind our pursuits. SO POWERFUL and in such Agreement…I may just burst… time fto run! Nailed it. Just brilliant. Thank you! Am I the only one who thought that the healing comment was more tied to the fact that putting in the miles that ultrarunners do means that most ultrarunners are constantly healing from injuries, or at least battling them, rather than a reference to some kind of psychic healing? That being said, I enjoyed the article very much. Outstanding article, Nick! It was great seeing you up top and then at the end. This piece is exactly what I needed to read after a disasterous race that was riddled with extreme cramping and blisters and turned my dreams of silver into a race to beat the cutoff. Really helps put the whole experience into perspective. I know and respect those that are healing from emotional travails and wrong turns in their lives. But I took that comment literally- I'm usually healing from my last race or last hard workout. Muir was right- we all benefit from the freshness and joy that nature's peace (and the athletic struggle of climbing) bring. I always felt huge waves of emotions and positiveness everytime I witnessed runners in races. You're right, Nick. You put it in perfect words!